ATLANTA – Delta Airlines is already using Surface 2 tablets in the cockpit and Nokia Lumia devices in the cabin, but will soon upgrade to the Lumia 1520 across its workforce of flight attendants as a point-of-sales (POS) solution. Put forward by Microsoft during the opening keynote at its Convergence conference and awarded in Microsoft’s Customer Excellence recognition program, Delta showcased how it’s using custom apps on Nokia Lumia devices running Windows Phone 8. 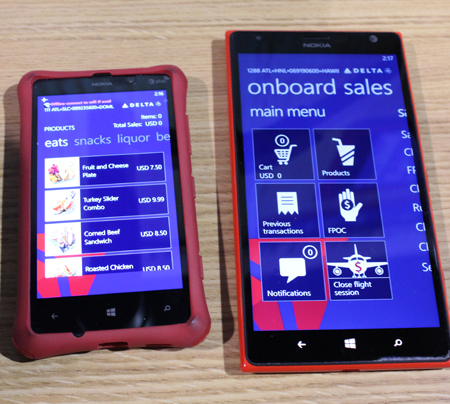 Currently Delta’s flight attendants are taking in-flight food orders using Lumia 820 phones, but will soon be upgrading to larger-screen Lumia 1520 devices. Delta flight attendants demonstrate a custom mobile app built on Dynamics AX backend at Convergence 2014. Using the smartphones, or “phablets,” as smartphones that exceed six-inches in screen size are sometimes called, flight attendants can also sell seat upgrades available on the flight, says Darrell Haskin, the director of IT for Delta. While Delta uses SAP for its corporate enterprise resource planning (ERP) system, it will be relying on Dynamics AX for its retail operations. It adopted Microsoft’s software about 18 months ago. “Although we sell seats to passengers, we never really considered ourselves to be in the retail space until recently,” he says. On the left, the Nokia Lumia 820 running Delta’s custom retail app. On the right is the new Lumia 1520. The mobile devices used by Delta’s workers are connected thanks to Ku-band satellite Internet provided by Gogo Inc. A secure WiFi network means the credit card payments, accepted via a phone attachment, can now be checked in real-time instead of after a flight touches down. During his opening keynote, Kirill Tatarinov, executive vice president for Microsoft Business Solutions, described Microsoft’s software as helping its customers to drive a culture that is customer-centric, an important focus when consumers have more options than ever before at their fingertips. The apps and services framework for Microsoft Dynamics AX will let customers take their own custom-built mobile apps – inside or outside the company firewall – and connect them to the ERP backend. Microsoft’s cloud platform, Windows Azure, sits in the middle between the mobile app and Dynamics AX to facilitate the communication. A white paper is offered to developers interested in creating the connection in their app. Further support for businesses looking to deploy custom mobile apps comes in the form of beta-mode Project Siena, a code-free platform for business managers to use to create apps that pull from multiple databases in the Microsoft stack, including Excel files, RSS feeds, SharePoint, and Azure Mobile services. 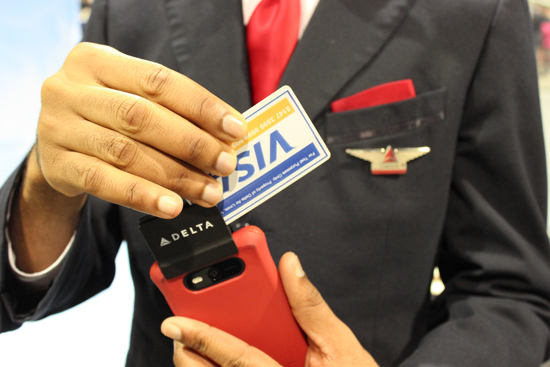 Delta can accept credit card payments using a smartphone attachment during flights. Microsoft is showing its customers that it’s easy to build out mobile solutions on its Azure cloud platform, says Ray Wang, the founder of Constellation Research. It’s focused on building out more vertical capabilities with Dynamics AX, particularly for the retail and manufacturing sectors. Mobile payments may have solidified themselves as an industry buzzword, but they won’t catch on with consumers until more retailers bring them into their brick-and-mortar stores, according to payment solutions provider Ingenico Corp.
Microsoft is also updating its other Dynamics products later this year, GP and NAV. GP is expected to see a release this quarter to include identity management, workflow, and self-service apps. NAV will see an update in Q4 of 2014.